In a still image taken from not independently confirmed video, Chinese riot police are seen pushing against protesters in the coastal village of Wukan, in Guangdong province, China. Armed with rubber bullets, shields and tear gas, Chinese riot police Tuesday clashed with local residents of a southern coastal village that was once seen as a symbol of grassroots democracy, but has become a flashpoint for protests against corruption. Protesters in Wukan in Guangdong province are angry about last week’s sentencing of former village chief Lin Zulian, who had pressed for compensation for land seized by Communist Party officials. Demonstrators have pledged to keep on protesting until he is released from jail. Authorities want the protests to stop and launched an overnight raid to snuff out any lingering unrest, arresting 13 villagers for allegedly inciting a mob and for using "intimidation and rumor mongering" to agitate participants of the village’s rallies. Wukan's relatively small but defiant protests in recent years have drawn international attention, in part because of locals long-running opposition to land grabs by developers, and the government's willingness to allow them to elect a village chief in 2012. Now that the chief has been jailed on what supporters argue are trumped-up charges, and the locals have continued to protest, authorities are quickly removing discussion of the protests online. However, villagers Tuesday apparently managed to upload several video clips and circulate them online. One clip showed a standoff in the middle of the day between riot police and residents, many of whom vented their anger by throwing stones at police as they fired tear gas and huddled behind shields. Another video showed riot police storming into a villager’s home before dawn and arresting an unknown suspect in his sleep. The video clips cannot be independently verified, in part because of the authorities' crackdown which has made communications with protesters difficult. The clash was reported to have led to injuries of tens of residents and the alleged death of an elderly woman, according to a Hong Kong-based online TV station. Pictures of some of those who were hurt were posted online. Following the arrests, authorities in Lufeng City claimed that they detained 13 people including protest leaders Tsai Jialin, Chang Xiangkeng and Yang Jinjen on suspicion of illegal assembly and disrupting public order. But analysts say the police’s raid was neither appropriate nor lawful. Rights lawyer Ge Yongxi argued that the arrest of any suspects on the charge of illegal assembly should have be made on site when they were allegedly refusing to stop protesting. “It is inappropriate to arrest those, who have dismissed [from their gathering] and returned home to sleep. The fact that they were able to safely return home means that their demonstrations have brought no immediate threat,” Ge told VOA, adding that there is little reason to believe that the peaceful protests staged by Wukan villagers were illegal. Ge was once hired by Lin’s family to represent him, but was dismissed by judicial officials. Last Thursday, the court found the village’s popular chief Lin guilty of taking bribes and granted him a combined jail term of three years and one month, in addition to a fine of nearly $30,000. The 72-year-old chief, who has accepted the ruling and said he will not appeal, is seen as a hero by many of the village’s 20,000 residents ever since he helped lead a rebellion in 2011 that led to the ousting of previous local officials for allegedly stealing land from residents and re-selling it to big developers. Weeks before his arrest, Lin had threatened to restart protests to press for compensation for villagers. 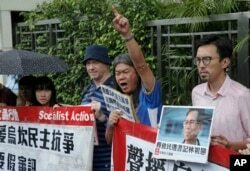 Protesters holding signs and a picture of Wukan village chief Lin Zulian are seen at a solidarity rally outside the Chinese central government's liaison office in Hong Kong, Sept. 9, 2016. While some land disputes have been resolved since he took over as village chief, many are still contested. And a day before the planned protest, Lin was detained in the middle of the night on suspicion of corruption. Despite Lin’s guilty verdict, the village’s residents continued to take to the streets to show their support for the chief and to fight for their own land rights. Prior to Tuesday’s arrest, the local government sent warnings to some protest organizers, many of whom apparently refused to abandon their demonstrations. That probably led to the police’s unannounced raid. Ge said he believes that the local police’s move to silence protesters will eventually backfire. “In the short run, the arrest may work to suppress and maintain stability. But in the long run, it will do no good to ease the conflict,” said Ge. Richard Tsoi, vice chairman of Hong Kong Alliance in Support of Patriotic Democratic Movements of China, agreed. “In general, we see the residents in Wukan village are very strong in their determination to fight for their rights, and also, to protect their village leaders including Mr. Lin,” he said. “So I would think, they will continue to fight,” Tsoi added. It is the level of determination, Tsoi said, that has probably intimidated local authorities, who waited for days before taking any heavy-handed action. Others, however, speculated that the timing was tied to China's hosting of the two-day Group of 20 summit last week and Wukan’s proximity to Hong Kong, which is watching the protests closely. They say the broad attention the village has received has made local authorities think twice about quickly resorting to the use of force.